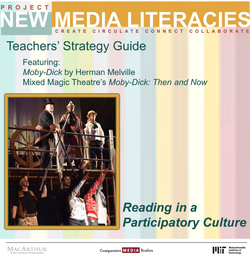 Project New Media Literacies (NML) is a research initiative established at MIT and funded by The John D. and Catherine T. MacArthur Foundation as part of their Digital Media and Learning Initiative. NML is now at University of Southern California’s Annenberg School for Communication & Journalism. Our central goal is to engage educators and learners in today’s participatory culture. Participatory culture stresses the role of teens as creators, circulators, connectors, and collaborators--rather than simply consumers--of media. Young people participate in the creation and circulation of media content within social networks that extend from their circle of face-to-face friends to a larger virtual community around the world. It is our belief that young people need to both make and reflect upon media and in the process, acquire important skills in teamwork, leadership, problem solving, collaboration, brainstorming, communications, and creating projects. The project identifies some of the core social skills and cultural competencies that young people need to acquire if they are going to be full participants in this new media environment. This research initiative encourages a diverse community to contribute in and discuss the potentials and challenges of this new learning culture for today’s digital kids. A collaboration with Howard Gardner's GoodPlay Project to produce learning tools that help youth understand the connections between the digital media skills they learn and their roles and responsibilities as "good" cyber citizens. The Media Makers Collection is a set of multimedia learning “challenges” to explore and practice the new media literacies and is hosted in the Learning Library platform for teachers and students to extend their learning by creating their own challenges. Strategies and lessons for integrating the tools, approaches, and methods of Comparative Media Studies into the English and Language Arts classroom. This project is being developed into a book published by Teachers College Press with release date of September 2012. Strategies and lessons for social studies classrooms to look at evolving digital cartographies and the ways we, as a people, envision ourselves in the digital and topographic landscapes.